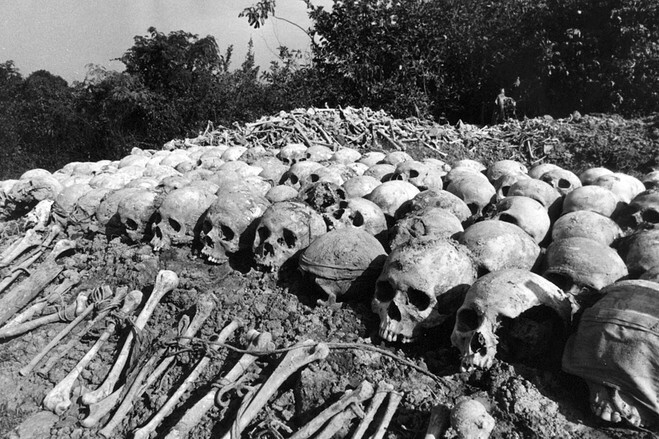 The genocidal rule of the Khmer Rouge began forty years ago this month. Their rise to power was inseparable from US intervention. The skulls of some of those who perished in the Cambodian Genocide. But Pol Pot’s rise to power, the Cambodian genocide, and the absence of justice for the KR’s victims are inseparable from broader US intervention policies in Indochina from 1945–1991 — in particular, the US’s vicious bombing campaign waged against Cambodia. The US began bombing Cambodia in 1965. From that year until 1973, the US Air Force dropped bombs from more than 230,000 sorties on over 113,000 sites. The exact tonnage of bombs dropped is in dispute, but a conservative estimate of 500,000 tons (almost equal to what the United States dropped in the entire Pacific theater of World War II) is unquestionable. They have got to go in there and I mean really go in. I don’t want the gunships, I want the helicopter ships. I want everything that can fly to go in there and crack the hell out of them. There is no limitation on mileage and there is no limitation on budget. Is that clear? Just how many people the United States killed and injured will never be known. In his book Ending the Vietnam War , Kissinger himself cites an apparent memo from the Historical Office of the Secretary of Defense stating there were 50,000 Cambodian casualties. The leading Cambodian Genocide scholar, Ben Kiernan, estimates the likely number to be between 50,000 and 150,000. Three F-111s bombed right center in my village, killing eleven of my family members. My father was wounded but survived. At that time there was not a single soldier in the village, or in the area around the village. 27 other villagers were also killed. They had run into a ditch to hide and then two bombs fell right into it. The US bombing campaign in Cambodia destabilized an already fragile government. When Cambodia won its independence from France in 1953, Prince Norodom Sihanouk became its effective ruler. A neutralist, Sihanouk’s primary objective was to maintain the integrity of Cambodia — a task that proved enormously difficult, as American, Chinese, and Vietnamese interests, as well as various left- and right-wing factions within Cambodia, were all pulling Sihanouk in different directions. Attempting a delicate balancing act, he played groups off one another, working with one group one day and opposing it the next. One group challenging Sihanouk was the Communist Party of Kampuchea, which would become widely known as the Khmer Rouge. The leadership of the party was roughly divided into two factions: one was pro-Vietnamese and advocated cooperation with Sihanouk, the other — led by Pol Pot — was anti-Vietnamese and opposed Sihanouk’s rule. By 1963, Pol Pot’s faction had mostly displaced the other, more experienced faction. The same year, he moved to rural Cambodia to formulate an insurgency campaign. Four years later, a peasant uprising known as the Samlaut Rebellion broke out in the countryside over a new policy that forced peasants to sell their rice to the government at below-black-market rates. To ensure compliance, the military was stationed in the local communities to purchase (or simply take) the rice from the farmers. With their livelihoods suffering, peasants launched an uprising, killing two soldiers. As the rebellion quickly spread to other areas of Cambodia, Pol Pot and the KR capitalized on the unrest, gaining peasant support for their fledgling insurgency. By 1968, KR leaders were directing ambushes and attacks on military outposts. Khmer insurgent (KI) [Khmer Rouge] cadre have begun an intensified proselyting campaign among ethnic Cambodian residents . . . in an effort to recruit young men and women for KI military organizations. They are using damage caused by B-52 strikes as the main theme of their propaganda. In 1969, the US air war against Cambodia escalated drastically as part of Nixon’s Vietnamization policy. The goal was to wipe out Vietnamese communist forces located in Cambodia in order to protect the US-backed government of South Vietnam and US forces stationed there. At the beginning of the escalation, KR fighters numbered less than 10,000, but by 1973, the force had grown to over 200,000 troops and militia. The US-backed coup that removed Sihanouk from power in 1970 was another factor that dramatically strengthened the KR insurgency. (Direct US complicity in the coup remains unproven, but as William Blum amply documents in his book Killing Hope , there is enough evidence to warrant the possibility). Sihanouk’s overthrow and replacement by the right-wing Lon Nol sharpened the contrast between the opposing camps within Cambodia and fully embroiled the country in the Vietnam War. Up until this point, there had been limited contact between the communist forces of Vietnam and Cambodia, as the Vietnamese accepted Sihanouk as the rightful government of Cambodia. But after the coup, Sihanouk allied himself with Pol Pot and the KR against those who had overthrown him, and Vietnamese communists offered their full support to the KR in their fight against the US-backed government. The KR were thus legitimated as an anti-imperialist movement. The [Khmer Rouge] cadre tell the people the Government of Lon Nol has requested the airstrikes and is responsible for the damage and the “suffering of innocent villagers” in order to keep himself in power. The only way to stop “the massive destruction of the country” is to remove Lon Nol and return Prince Sihanouk to power. The proselyting cadres tell the people that the quickest way to accomplish this is to strengthen KI forces so they will be able to defeat Lon Nol and stop the bombing. In January 1973, the United States, North Vietnam, South Vietnam, and South Vietnamese communist forces signed the Paris Peace Accords. US forces withdrew from Vietnam, and the bombings of Vietnam and Laos were discontinued. Yet the Nixon administration continued bombing Cambodia in order to defend Lon Nol’s government against KR forces. Facing intense domestic and congressional opposition, Nixon was forced to end the campaign in August 1973 after reaching a deal with Congress. For the next year and a half, civil war continued to rage between the government and the KR. The KR succeeded in capturing numerous provinces and large areas of the countryside, and they finally took control of Phnom Penh in April 1975. The geopolitical map was in flux after the Vietnam War — North Vietnam installed a provisional government in South Vietnam until the country was reunified in 1976, and Washington was determined to isolate the communist government. At the same time, the United States sought closer relations with China as a way of redistributing global power away from the Soviet Union; it saw Cambodia as a potentially useful counterweight. But the KR would largely chart an isolationist course, concentrating instead on its project of building a self-sufficient, agrarian society that ended in mass murder. At the end of 1978, in an escalation of border disputes between the countries, Vietnam invaded Cambodia and toppled the KR government in early 1979. KR forces fled to western Cambodia on the Thai border to begin a guerrilla campaign against the new, Vietnamese-installed Cambodian government. The genocide the KR had orchestrated was over, but now self-serving foreign parties, including the United States and China, chose to support the KR guerrillas in their campaign against the Vietnamese occupation, as part of an overall policy of isolating Vietnam. A key method to achieving this end was US support for overt Chinese aid to the KR guerillas. As the New York Times reported, “the Carter administration helped arrange continued Chinese aid” to the KR guerillas. Zbigniew Brzezinski, Jimmy Carter’s national security advisor, explained that he “encourage[d] the Chinese to support Pol Pot.” According to a report from the Associated Press, US intelligence agencies estimated that China supplied KR guerrillas with about $100 million of military aid per year throughout the 1980s. In recognizing them as the legitimate government of Cambodia and seating them at the United Nations, the United States, China, and several other European and Asian countries also gave diplomatic support to the KR. The United States even refused to call what the KR had done from 1975–1979 genocide until 1989, so as not to hinder efforts to back the guerrilla movement. Support came in other ways. According to Kiernan, the United States spent tens of millions of dollars funding guerrillas allied with KR forces throughout the 1980s and pressured UN relief agencies to supply additional “humanitarian” aid to feed and clothe the KR hiding out near the Thai border, thus enabling the KR to wage their campaign against the Vietnamese. In 1989, Vietnam withdrew its troops from Cambodia. Two years later, nineteen governments (including the United States, China, Cambodia, and Vietnam) signed peace agreements with KR guerrillas and their allies to end the conflict. But US support for Pol Pot and the KR continued after the peace accords. It was not until 1997 “that the United States gave the green light to go after the elusive Khmer Rouge leader [Pol Pot].” Trials for KR leaders would have proven uncomfortable for multiple parties, not least for some in Washington. Indeed, when the Khmer Rouge Tribunal (officially the Extraordinary Chambers in the Courts of Cambodia) was finally established in 2003, after years of negotiations with the United Nations, it explicitly chose only to cover crimes committed by KR leaders while they were orchestrating the 1975–1979 genocide, ignoring US crimes that helped nurture and sustain the KR. Victims of the Khmer Rouge have received little justice, and they are unlikely to ever see it. The great powers (particularly the United States) have no interest in providing an honest accounting of why the KR came to power in the first place, or how the United States supported them and shielded them from justice for decades, even after they were driven from power. Any lessons to be drawn about the consequences of US intervention in Cambodia do not appear to have been learned: as the journalist John Pilger has pointed out, just as the massive destruction of Cambodia by the US bombing campaign helped create the conditions for the KR’s ascension, the US invasion of Iraq similarly destroyed a society and set the stage for the rise of ISIS. And just as the United States supported its former enemies in Cambodia against Vietnam throughout the 1980s, Washington entered into a tacit alliance with jihadist groups in Syria against Bashar al-Assad’s government. Indeed, if we can expect anything from US foreign policy, it’s atrocities and complicity, cloaked in the language of democracy and human rights.